MARCH NEWSLETTER now available in Members Area page. Just a reminder to club members, your club dues are now due by April 30th. 2) Camaraderie and a shared interest in American Flyer and other S gauge trains. 3) Co-Operative effort to continually improve and operate our modular layout. 4) Display modular layout to increase public awareness and interest in American Flyer trains. 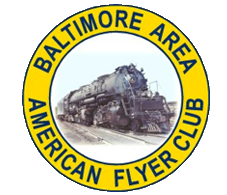 AMERICAN FLYER IS THE REGISTERED TRADEMARK OF LIONEL CORPORATION. THIS SITE IS NEITHER AUTHORIZED NOR APPROVED BY LIONEL CORPORATION.